There is more potential than usual for scandal in the Russian March held annually on Nov. 4 as nationalists have split over the situation in Ukraine. The Russian March will take place as usual in Moscow on Nov. 4, a national holiday established in 2005 to mark unity between the different peoples of Russia. The Russia March is the biggest gathering of nationalists in the country, with approximately 30,000 people taking part annually. This year, the Moscow authorities are more concerned than usual about the upcoming march because of the division in the Russian nationalist movement brought about by the crisis in Ukraine. On Oct. 23, just days before the march, Alexander Potkin, one of the leaders of the Russian nationalists and a co-organizer of the Russian March, was arrested in Moscow on two separate charges – fraud, and inciting racial hatred. Potkin’s colleagues see political motivations in the move. "He was taken as a hostage, in order to frighten everyone else," said Vladimir Basmanov, a leader of the nationalist group Russkiye. Press Digest: Will there be a Maidan 3.0? "This is political revenge," said Basmanov. "Sasha [Potkin’s nickname] had refused to publically support Putin's foreign policy in Ukraine and participate in the transportation of volunteers to the Donbass as the presidential administration had demanded of him. He was not forgiven for this." Dmitri Demushkin, another leader of the Russkiye group said in an interview that he is convinced that he will also soon face arrest. "A few months ago I spoke with some representatives of the FSB, who advised me not to hold the Russian March this year due to the 'intense geopolitical situation.' I responded that, in connection with this situation, they should also stop their activity for a year," Demushkin said. Speaking on condition of anonymity, a representative of the Russian presidential administration told RBTH that the reason the authorities are currently so attentive to nationalist leaders is that most of them have either declared their support for Kiev or not taken any side in the conflict in Ukraine. Now the government is afraid that the Russian March will become a march of support for Ukrainian nationalists. This year, the authorities approved the Russian March only at the last moment, even though the march's organizers had met all the legislative requirements when filing their application. Additionally, the march was approved only for the bedroom community of Lyublino, although it had taken place in the city center in previous years. RBTH’s questions to the Moscow Mayor’s Office and the city police regarding the remote location of the march and the kind of security the municipal authorities intended to provide were ignored. Although the organization committee of the current Russian March has chosen "For Russian Unity!" as the official slogan of the event, judging by the websites of the nationalist organizations involved, no such unity is expected. At the beginning of September, a far-right nationalist group page in Russia’s dominant social network VKontakte conducted a survey asking what users would like to see in the upcoming Russian March. More than 15,000 people responded. Nearly a third, 31.2 percent said that the event should focus on support for the pro-autonomy separatists in the Donetsk and Lugansk regions. Over half, 51.9 percent, said that the march should take place under the slogan of Russian-Ukrainian Slavic Unity. And only 16.9 percent of the people surveyed thought that Ukraine should not factor in the march at all. Dmitri Demushkin of the Russkiye group said that, contrary to reports, there is no division within Russian nationalist groups. "It is the Kremlin and the liberal media that are creating all these myths," said Demushkin. "There are some disagreements on several issues among the nationalist organizations participating in the Russian March each year. But there have never been, there could not possibly have been, any clashes. Because we are united in the most important thing: we all want to live in a national state where the rights of the indigenous Russian population will not be violated, where there will be no ethnic crime and where all the resources will belong not to the oligarchs, but to the people." To reinforce his point, Demushkin pointed out that in the Nov. 4 march, supporters of the militias in the Donbass will be separated from the nationalists supporting Kiev by a column of Slavic neopagans. Demushkin seems to ignore, however, the fact that for the first time, the march will include participants who have fundamentally different views on a significant geopolitical point – the situation in Ukraine. Before, the biggest potential for violence seemed to come from football fans. "My friends are now fighting in the Azov Ukrainian battalion [ed. 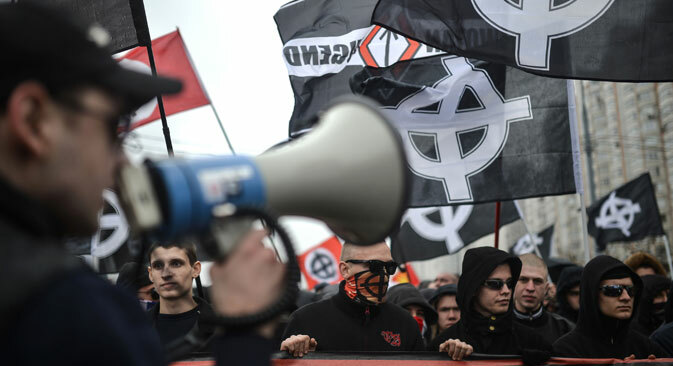 – a group of national-socialists fighting with the Ukraine national guard] said Andrei S., 28, a representative of the WotanJugend national-socialist community, which also intends to participate in the Russian March. Andrei says there will be 2,000 people marching with the national-socialists. "The idea of Novorossiya [ed. – the 19th century name sometimes used to refer to the Donetsk and Lugansk regions of southeastern Ukraine] includes the idea of restoring the Soviet Union, and not only in the territorial sense, but also in the ideological one," Andrei said. "This has nothing to do with defending the Russian population. The demonstrations in the southeast took place under the banners of communism and with the portraits of Lenin, Stalin and Putin. The uprising itself has been prepared and provoked by Russia's FSB, which is essentially an anti-Russian regime." How these groups will march together "For Russian Unity!" is still unclear. Yevgeny Levkovich is a journalist and civil activist.